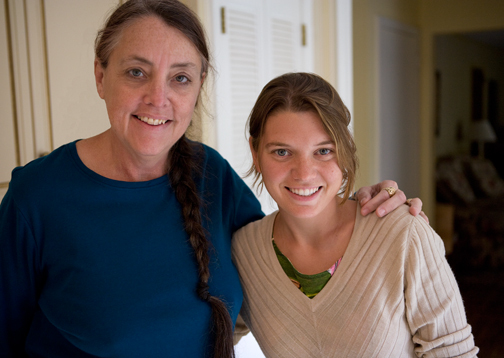 Last Wednesday I spent the day with Maggie Doyne, a family friend, neighbor and subject of our film Opening Our Eyes. We spent the afternoon looking at hours of footage that we shot when we visited Maggie and her children in Nepal last summer. we talked, we looked at the footage that I hadn’t seen in awhile and we had a nice simple lunch. Being with Maggie is like getting a shot of goodness and it brought back a lot of nice memories of the journey that Erin and I took last summer. It’s hard to believe that next month it will be a year since we left on our global journey. There are days that the trip is so fresh in my mind and others when it seems like a distant memory. I am still so hands on with the project – editing but for Erin it must seem like it happened in another lifetime. Maggie said something that really rang true. As she watched the interview and other footage that we shot of her at the Kopila Valley Children’s Home and School she remarked how far she and all the people at Kopila Children’s Home had come since then. When we were there shooting, the school was still under construction even though classes had already begun. And the new kitchen hadn’t been finished yet either. Now both are completed and used on a daily basis. I thought about how I had been feeling this past winter as I spent 14 hours a day, every day in the editing room for two months solid and I couldn’t see an end in sight to this film becoming a reality. But now it’s in the hands of a great editor with a due date to be completed late next month. When we started our journey almost a year ago, I never imagined that I would still be so entrenched with this project a year later. But then I look back from where I came and I can see how far I’ve come. I needed to be reminded to look back every now and then and observe from that perspective. Thanks Maggie once again for your inspiration. This entry was posted in People Making a Difference, Philanthropy, Travel, Video and tagged adventure, around the world, Blinknow, children, cultures, discovery, documentary, extraordinary people, helping others, inspiration, journey, Maggie Doyne, orphans, passion, People Making a Difference, philanthrophy, power of one, round the world travel, sharing, Travel, traveling abroad, video, volunteers. Bookmark the permalink. A marvelous person with a saintly purpose………………….. Yes Bob and the world needs more people like her.